Boulder Housing Partners and Flatirons Habitat for Humanity worked together to design and build family housing on the 3.2-acre site located at 4525 Palo Parkway. 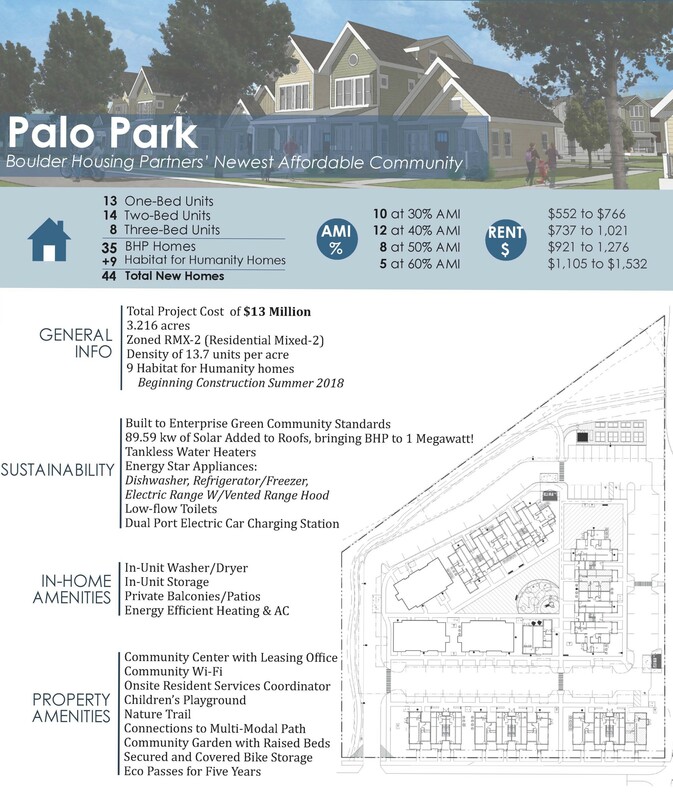 Palo Park offers 35 one, two and three-bedroom affordable apartments and townhomes, and nine affordable for-sale townhomes under development through Flatirons Habitat for Humanity. Apartment homes at Palo Park are large and energy efficient, with in-unit washers and dryers and central air conditioning for each home. Palo Park boasts a new playground, community gardens, and is adjacent to the Four Mile Creek and a multi-modal path. Also, a community center offers a variety of programs and workshops. As part of its transportation demand management strategy, BHP is providing 5-year Neighborhood EcoPasses for all residents and is funding improvements to a nearby transit stop. The project has been a unique opportunity to create new affordable units for families and individuals in a well-designed, sustainable, and vibrant community. Monthly rents for the apartments are affordable to residents earning 30 to 60 percent of area median income, or a household income of $29,340 to $58,680 for a family of three (based on the 2018 CHFA Income and Rent Limits chart). This is attainable to many workers in the education, healthcare, retail, arts, recreation, and hospitality sectors, according to the Community Foundation of Boulder County.